Sometimes when you grow your business you need to make adjustments and that can include a name change. While rebranding is one of the major reasons that you might want to change a Facebook page name, there are some other reasons too. You may want to add/remove information about your Page to the name. Or the subject matter/nature of your Page may have changed. Perhaps it is simply the case that your Facebook page name is misspelled and you want to fix it. advice for what to do if things go wrong. How easy is it to change your business’s Facebook page name? Changing your business’s Facebook page name is now a lot easier than it was in the past. But you can still run into some issues if you aren’t aware of certain things, for example, Facebook’s page naming guidelines. Also, you can’t just change your business name on Facebook and see the update take place immediately. A human Facebook administrator will need to check that your new name is acceptable and approve it before it can take effect. Unfortunately, as you’ll read if you do a Google search for ‘change Facebook page name’, many people have had their new page names rejected and are none the wiser as to why. The reason is probably that the proposed new name has violated Facebook’s page guidelines in some respect. More on what to do about this later. For now, all you need to know is that if you have 200 or more ‘likes’ then you have to be an administrator of the site to submit a request to change your Facebook page name. If you have less than 200 ‘likes’ you may be able to change it without needing to be an admin. Let’s move on to how to actually go about changing your Facebook page name. Click on the ‘About’ tab on your Facebook page on the upper left-hand side of the page. Once you’re in the section click ‘Edit’ next to your page’s current name. Underneath there will be two headings: Current Page Name and New Page Name. Not use generic words or locations (e.g ‘Pizza’ or ‘Brisbane’). Need to update your business story to go with that name change? Download the FREE Story Worksheet to get started today. Type in your new name and click ‘Continue’ to submit it. This will take you to another box that will ask you to confirm your name change request. If you want to edit the name change then click ‘Back’ or ‘Cancel’ to exit this box. If you’re happy with the change then click ‘Request Change’. You’ll see a box saying that they’re reviewing your name change request, and you’ll be sent a notification when the review is complete. You can also check the status in your Page Support Inbox. You can see the steps that I’ve outlined above in Facebook’s help centre instructions for easy referral. Now all you need to do is wait for approval. As it says in the Confirm Name Change Request box, Facebook takes up to three days to approve the name change. They may also request additional information in order to make their decision. One thing to mention is that if your request is approved, then you won’t be able to change the page name or unpublish it for seven days. Note: once you change your Facebook page name you’ll also need to change your username (this is updated automatically with no wait time). See instructions on how to change the username for your page. 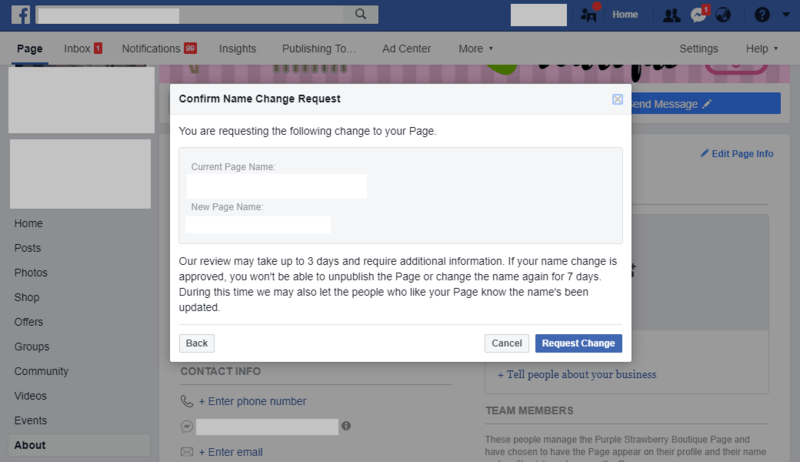 Although the process for changing your Facebook page name is relatively easy, you may face issues with getting your new name approved. There are various reasons why this happens. Below I’ll run through a few of the FAQs you might have and what to do about it. Why has my new name been rejected? Check again that your new name isn’t breaking any of Facebook’s conventions for page naming and it’s close enough to the current name. Your page also may have limits on it if it doesn’t follow community standards or Facebook’s page policies. I’ve tried 2 or 3 times to change the name, why is it still not approved? This article suggests that sometimes it’s a case of being persistent. The author kept trying different variations and eventually one was approved. It did take them nine tries at it though! Can I contact Facebook about it? Yes, if you’re still having trouble renaming your page, you can submit an appeal to change your page name by filling out this form. Is it just easier to start a new page? If you don’t have many likes or the page hasn’t been used much, it could be easier to just create a new business page with the new name. However, if you have a big fan base with a large amount of ‘likes’, trying to convert existing fans to ‘like’ the new page may not be too successful. If you want to do this, you could alert fans by posting a message to your page so your audience knows why you've changed your name and doesn't unfollow because they don't recognise the name. Remember to change any links from your website to your new Facebook URL after the name change. I hope this helps clear up any confusion about what you need to do to change your Facebook page name, and that you can now do this successfully without too much hassle! Need to update your business story to go with that name change? Click on the image below and download the FREE Story Worksheet so you can get started today. Have any questions about changing your Facebook page name that aren't covered here? Ask your questions below in the comments.